The Poly-Stage Precipitator provides a practical way to comply with the new pollution control codes, economically - at minimum capital expenditure and minimal operating expense. Future expansions and altering requirements can readily be accommodated. 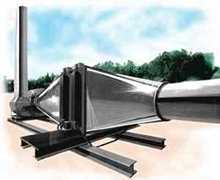 The Poly-Stage Precipitator operates at less than 2 cents/hr/10,000 CFM. Power consumption is less than 100 Watts/1000 CFM. Minimal pressure drop is maintained at less than 0.6" WG allowing existing ducts and blowers to be used. The Poly-Stage Precipitator system will reclaim particles and aerosols as small as .01 microns from process emissions common to modern industrial and chemical operations. This reduces air contamination and permits reclamation of valuable components and re-usable liquids. The Poly-Stage Precipitator system is designed with multiple functional modules assuring efficient operation at low voltage and constant operation during portional outages. Our engineers design and arrange modules to suit each specific emission problem. The chart above is used to dramatize the comparative size of various pollutants and the superior efficiency of the Poly-Stage Precipitator on particles not visible to the naked eye. The Poly-Stage Precipitator removes sub-micron smoke by electronically charging (negative) the particles as they pass through the high-voltage ionizing screen. These particles are then attracted and adhere to collecting plates, which form the positive elements of an electrostatic field set up between a series of parallel plates electrically charged alternatively positive and negative. Oil and plasticizer smoke collecting on the plates drain into a sump. May be roof or deck mounted in existing ductwork, anywhere at easy access. Reclaimed liquid fractions are sump-drained to drums. Rental units available for testing. Light and compact units enable easy mounting on roof or in existing exhaust system.